'roulin' is a poem that I wrote as part of a writing exercise to create a piece of ekphrastic poetry. An ekphrastic poem is a poem that describes a piece of art, usually reflecting upon a scene or the subject matter so as to illuminate it further. I wrote mine on The Postman by Vincent Van Gogh, exploring the act of portraiture and the intimacy behind it. 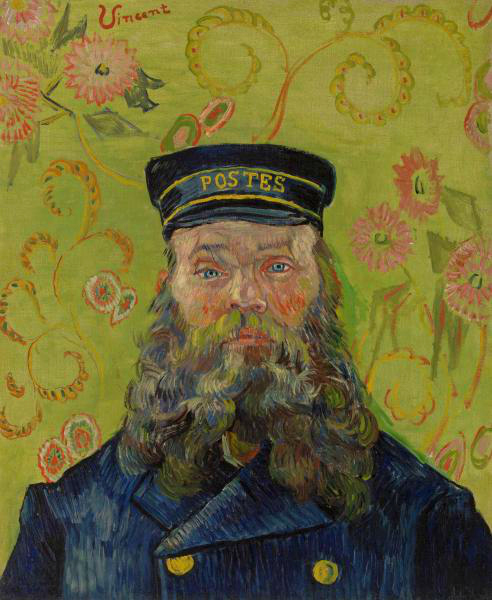 Joseph Roulin, the bearded chap in the painting, was a Postman at a railroad station in Arles that Van Gogh befriended and painted, along with Roulin's family members, over the course of two years. Gogh wanted to paint more portraits but he rarely had the opportunity to do so, due to money and logistics, so he was pleased to find the Roulin family. In exchange for sitting for portraits, the family were allowed to keep a painting each - hence the 'museum of modern art'. The family wouldn't have been able to afford portraits of themselves otherwise and I wanted my poem to reflect the novelty of seeing oneself in a medium that wasn't accessible otherwise. After noting that the tones in Joseph's beard matched that of the blues and greys in Van Gogh's 'The Starry Night', I decided to make that the focus of the piece. 'roulin' is about friendship. The family had all these paintings, as a result of said friendship, which was truly something but it was perhaps the things that the paintings revealed within them about what Van Gogh saw in Roulin that is, to me, the most wonderful thing. It's quite different from what I tend to write but I like it when little writing exercises encourage you to step away from a set style and do something a little different. I like the sentiment of this poem, even if it's a lot more stripped back than usual. If you liked this, why not read some more of my creative writing?